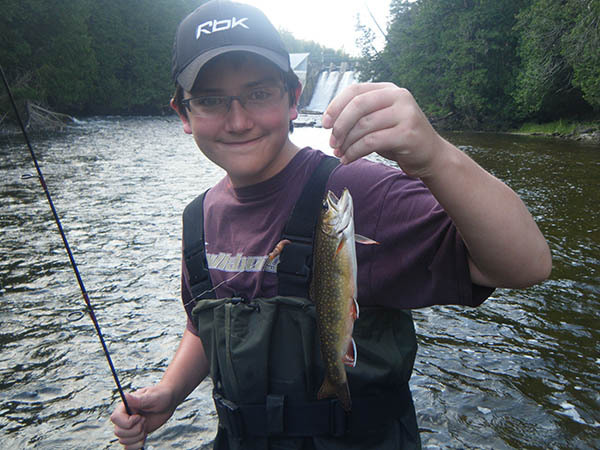 Liam is a 14 year old boy I took out fishing for the day with his uncle in 2010. This is what he had to say about his day. "Peter, it was great to be able to go fishing with you. I caught my first trout! Thank you so much. I haven’t had that much fun on past fishing trips. You taught me how to fish. It surprised me to learn that there’s more to fishing than just throwing a line in the water. You taught me so many things that are difficult to understand in books. It was interesting to learn about knots, lures and other things… You know it all. I discovered that it’s so important to know where and when to go fishing. I believe that we caught about 20 fish, which we returned to the river. Without you, it’s quite possible I wouldn’t have caught my first trout. Although I sometimes have trouble focusing, fishing with you was easy, for you made it so much fun. I hope my uncle will take me with him the next time he goes fishing with you. Even though the waders were a bit big, it was fun to wear them."